Abstract: The Texas Supreme Court has final appellate jurisdiction in most civil and juvenile cases. It also has the authority to conduct proceedings for the removal or involuntary retirement of state judges; supervises State Bar operations; promulgates rules and regulations for the discipline, supervision, and disbarment of lawyers; and has supervisory and administrative control over the judicial branch. The records consist of case files, applications, opinions, dockets, indexes, registers, and minutes covering the period 1840-2004. Also present are the records of the Texas Commission of Appeals, consisting of opinions, dockets, and minutes, dating 1879-1892, 1918-1943. A portion of these materials have been digitized and are part of the Texas Digital Archive. Location: Please note that the A, B, C, D, and 94 through 04 case files (except misfiles and oversize items) are stored at the State Records Center. Because of the possibility that portions of these records fall under the Public Information Act exceptions, these records must be reviewed by an archivist before they can be accessed for research. Records requested before 10:00 a.m. will usually be available for review by an archivist by 4:00 p.m. the same day. Records requested after 10:00 a.m. and before 3:00 p.m. will usually be available for review by an archivist by noon the next day. See the “Restrictions on Access” statement in this document for further information. 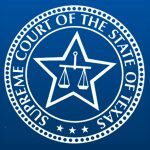 Orders and opinions of the Supreme Court are available on the Texas Judicial Branch website from October 1997 to present. The M case files direct and reverse index and 1890s case files direct and reverse index card files described in the Indexes and registers series; the Supreme Court dockets (circuit court period) described in the Dockets series; and a portion of the M case files described in the Case files series of this finding aid have been digitized and are part of the Texas Digital Archive. A description of the original records referenced in this finding aid, including those not digitized, is available at https://legacy.lib.utexas.edu/taro/tslac/20169/tsl-20169.html. Minutes, 1841-1943, 21.78 cubic ft.
Supreme Court minutes, 1841-1943, 19.33 cubic ft.
Commission of Appeals minutes, 1879-1892, 1918-1943, 2.45 cubic ft.
Indexes and registers, 1840-1995, 25.43 cubic ft. Dockets, 1840-1980, 64.65 cubic ft.
Supreme Court dockets (circuit court period), 1840-1892, 22.22 cubic ft.
Supreme Court dockets, 1892-1980, 40.17 cubic ft.
Commission of Appeals dockets, 1879-1892, 1918-1943, 2.26 cubic ft. Opinions, 1840-1949, 31.22 cubic ft.
Supreme Court opinions, 1840-1949, 22.61 cubic ft.
Commission of Appeals opinions, 1881-1885, 1888-1892, 1922-1943, 8.61 cubic ft. Rejected applications, 1892-1943, 524.17 cubic ft.
Overruled applications for writs of mandamus and habeas corpus, 1901-1943, 26 cubic ft.
Case files, 1840-2004, 13,343.25 cubic ft.
M case files, about 1840-1892, 680.08 cubic ft.
No prefix case files, 1893-1943, 1,644.17 cubic ft.
A case files, 1944-1966, 1,934.25 cubic ft.
B case files, 1967-1980, 1,526.75 cubic ft.
C case files, 1981-1990, 2,056 cubic ft.
D case files, 1991-1993, 1,505 cubic ft.
94 through 04 case files, 1994-2004, 3,997 cubic ft. The Texas Supreme Court has final appellate jurisdiction in most civil and juvenile cases. It also has the authority to conduct proceedings for the removal or involuntary retirement of state judges; supervises State Bar operations; promulgates rules and regulations for the discipline, supervision, and disbarment of lawyers; and has supervisory and administrative control over the judicial branch. The records consist of case files, applications, opinions, dockets, indexes, registers, and minutes covering the period 1840-2004. Also present are the records of the Texas Commission of Appeals, consisting of opinions, dockets, and minutes, dating 1879-1892, 1918-1943. The records document the actions of the justices but do not cover the more routine or administrative functions of the clerk or other aspects of the functioning of the judicial system. The case files are the most voluminous series in the records. Case files presently held by the Texas State Archives are the M case files (1840-1892), No prefix case files (1892-1943), A case files (1944-1966), B case files (1967-1980), C case files (1981-1990), D case files (1991-1993), and 94 through 04 case files (1994-2004). As of 2017, the 05 and later series are held by the Supreme Court. Case files may possibly contain documents sealed by the court, and are therefore excepted from public disclosure by the Texas Rules of Civil Procedure, Rule 76A. When a researcher requests a case, the file will be reviewed by an archivist in order to remove sealed documents. The researcher will be informed that sealed documents have been removed from the file, and it will then be up to the researcher to obtain permission from the original court to access the documents. Case files may possibly also contain personal information of jurors and prospective jurors. According to the Texas Code of Criminal Procedure, Article 35.29, information collected by the court or by a prosecuting attorney during the jury selection process about a person who serves as a juror, including the juror’s home address, home telephone number, social security number, driver’s license number, and other personal information, is confidential and may not be disclosed by the court, the prosecuting attorney, the defense counsel, or any court personnel except on application by a party in the trial or on application by a bona fide member of the news media acting in such capacity to the court in which the person is serving or did serve as a juror. On a showing of good cause, the court shall permit disclosure of the information sought. (Acts 1993, 73rd Leg., ch. 371, § 1, effective September 1, 1993). The Court of Criminal Appeals has verified that juror information is to be withheld from the public according to the statute cited above. Therefore, when a case is requested, an archivist will review the case to ascertain whether or not juror information is present. If such information is found, the researcher will be informed and the documents will be removed from the file. If an individual wishes to access juror information, they will have to obtain permission from the original court. Because the judiciary is not covered by the Texas Public Information Act, the Archives cannot estimate how long it will take the court to respond to a request. Rarely, case files may possibly contain material not related to the case, such as attorney’s notes about another case. Before a researcher is granted access to a case, an archivist will review the files and remove all such materials. The researcher will be informed if materials are removed. If the researcher wishes to access the documents, the Archives will contact the court to determine the appropriate course of action on a case-by-case basis. Because the judiciary is not covered by the Texas Public Information Act, the Archives cannot estimate how long it will take the court to respond to a request. The Canyon Dam and Melvin Belli records, the Houston urban expressway plans, and the Judge O.P. Carillo hearings are exhibits from Supreme Court cases. Texas Commission on Judicial Conduct public records and sanctions, 1973, 1978-1988, 0.71 cubic ft.
Texas Highway Department Houston urban expressways proposed improvement plans, 1962-1963, 0.92 cubic ft.
Texas State Judicial Qualifications Commission hearings for removal of Judge O.P. Carrillo, 1971-1976, 4.47 cubic ft.
Texas Supreme Court, Canyon Dam and Reservoir records, 1958-1965, 0.5 cubic ft.
Texas Supreme Court, Galveston term clerk’s correspondence, 1868-1870, 0.47 cubic ft.
Texas Supreme Court, Galveston term naturalization ledger, 1855, 1867-1869, bulk 1855, 0.05 cubic ft.
Texas Supreme Court, Provost of Judicial Education records, 1988-1993, bulk 1992-1993, 2 cubic ft.
Texas Supreme Court, State Bar v. Melvin Belli records, 1964, 0.05 cubic ft.
Texas Supreme Court, Administrative Division, Supreme Court’s annotated copies of blueprints and drawings of buildings in the Capitol Complex, 1956-1991, bulk 1988-1990, 2.52 cubic ft.
Texas Supreme Court Chief Justice Robert Calvert papers, 1950-1972, undated, 28.75 cubic ft.
Texas Supreme Court Justice William W. Kilgarlin working papers, 1983-1988, 51 cubic ft.
Digest of the Decisions of the Supreme Court of Texas; from January term 1840, to the close of the spring term, 1853…., W. Alexander, Philadelphia, Pa.: T. & J.W. Johnson, 1854. Opinions of the Supreme Court of Texas from 1840 to 1844 inclusive, James Wilmer Dallam, St. Louis, Mo. : Gilbert Book Co., 1883 [c. 1881]. (Identify the item and cite the series), Texas Supreme Court records. Archives and Information Services Division, Texas State Library and Archives Commission. These records were transferred to the Archives and Information Services Division of the Texas State Library and Archives Commission by the Texas Supreme Court on November 22, 1982; September 6, 1983; November 1, 1984; April 15, 1985; June 19, 1989; May 10, 1991; November 24, 2008; March 14 and August 2, 2011; February 28, 2012; October 13, 2014; and January 23, 2015; by the Texas Historical Commission on May 4, 1988; by Dorothy Sloan on October 18, 1995; by Tammy Kubecka on April 28, 2005; and March 18, 2015; by Peter Luke on May 25, 2005; and November 27, 2011; by the Heritage Auction Galleries on December 19, 2007; by the Texas Attorney General’s Office on June 23, 2008; July 1, 2010; and September 2, 2016; by the Texas Attorney General’s Office from Heritage Auction Galleries on March 11, 2009; by Maria McPhail via Heritage Auction Galleries on March 29, 2010; by the Texas Attorney General’s Office from Early American History Auctions on October 2, 2009; by the Texas Attorney General’s Office from Danny Reich on August 2, 2010; by the Texas Attorney General’s Office from the Gettysburg Quartermaster on August 17, 2010; by Rolando Gallo on October 8, 2010; by Ed Hoffman on October 26, 2011; by RR Auction on November 14, 2011; by Sherry Evans on December 5, 2011; by Carl G. Horkowitz on March 23, 2012; by Mark E. Mitchell on August 1, 2014; by Richard D. Worthington on March 30, 2015; by James H. Twelmeyer on April 27, 2015; by Diana Faust via the Texas Supreme Court on May 12, 2016; by Ian Brabner on May 26, 2016; by James Cummins on June 2, 2016; by Jared Gendron on June 13, 2016; and by Tyler Ribitzki via the Texas Attorney General’s Office on June 2, 2017.